Probably only a handful of my loyal readers know just how important I am - er, WAS until last week. Until last Sunday at about noon-thirty, I was the President of the Louisiana Sports Writers Association. Elected in June of 2010, I succeeded the great editor of the Bunkie Record into the office, a man who knows more politicians than the D.C. Madam. No, I was not the first female president of the organization. The great Prep Editor of the Baton Rouge Advocate, Ms. Robin Fambrough was the first. I was the second. And it's probably good that there wasn't a whole lot of work to do because, two weeks after my election two men in ties told me I was no longer a sports writer for The Times-Picayune. I was moved to the front desk to be a receptionist/clerk/cashier/crime reporter. Yes, I went from being a Prep Writer to a Perp Writer. But, in my free time waiting for the Mayhem Guy to strike, I did manage to build our group a web site and a Facebook page. The best part of the job, however, was the annual Hall of Fame Induction ceremony. Every year us sports writers (and ex sports writers) get together and elect a handful or so of Louisiana's greatest sports legends to be inducted into our not-quite-finished Hall of Fame in beautiful downtown Natchitoches. Just because we don't have a place to put them isn't going to stop us. Last year, it was a dream come true when we inducted legendary New Orleans Saints place kicker Morten Anderson (who I used to have a mad crush on -- along with every other red-blooded woman in NOLA). 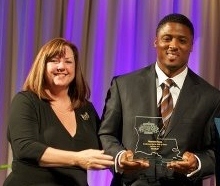 This year it was Warrick Dunn. Even if you don't follow football, you may know Dunn's story. A fabulous high school football player with the future at his feet, Dunn was a senior in high school when his mother, a Baton Rouge police officer, was shot and killed while accompanying a store manager for a night deposit. The young Dunn was left with six younger siblings. To raise. I remember the event, and remember praying for him and his family and thinking, "God. I hope the universe pays him back. I hope he gets everything he deserves." He did. The community and his family stepped up and allowed him to go to Florida State to play for the legendary Bobby Bowden. Then he went on to an extraordinary career in the NFL with the Tampa Bay Buccaneers -- despite being "too small" to play running back. He has spent the ensuing years giving back through his Warrick Dunn Foundation, most notably by giving away homes to working parents, helping other kids who have lost parents to violence and being just an all around good guy. And in August he was elected to our Hall of Fame. And then the universe paid me back. My soon-to-be-ex editors asked me to do the story on him. Thrilled to do a sports story of any kind -- especially one on him -- I jumped at the chance. And after making the right connections, he was sent my cell phone number. And on a Friday morning he called me. It wasn't my best interview. He made me nervous, which almost never happens. But I got what I needed for a fairly decent story. Then, last week, we both headed to beautiful downtown Natchitoches, where we had a brief but torrid affair. OK. It was a Twitter affair. To my shock and delight, he tweeted me back! I wasn't kidding, though, about stalking him. I found him at the kickoff press conference and introduced myself. Bad picture. Not all sports writers are photographers. Then again at the hotter-than-hell golf tournament. Yes I wore my BLACK Save The Picayune shirt in the 104 heat. And I continued to tweet! Yes. It's good to be The Prez. In all seriousness, my reign as president of the LSWA was one of the greatest honors of my life. I have been with these people for more than 20 years, in press boxes, on playing fields, in long boring meetings and at our annual conventions and Hall of Fame inductions. We tell stories, we laugh, we pick on each other, we play Bourre, we drink and, through it all, we became a family. That they thought enough of me to elect me their president meant the world to me. On Sunday, I handed the office over to my former fellow prep writer and former editor and soon-to-be former co-worker, Jim Kleinpeter, (I was cut. He was not) with a kiss and a hug and more than a few tears. I tried to deliver this little speech... But failed. Just two weeks after being elected president of the LSWA, two men in ties told me I was no longer a sports writer and broke my heart. So, I've spent the last two years being your president/crime reporter/clerk and toilet-paper-orderer. And I was pretty angry and bitter. Then, just two weeks ago, they told me I was no longer employed. After 26 years. And I've been pretty angry and bitter. But last night, sitting on that stage, I had LOTS of time to think (LOTS of time). And I realized how LUCKY I have been. Not just to kiss Warrick Dunn and Deuce McAllister and Morten Andersen, but to have gotten to meet and know all of you. I leave today with the title of president behind me, with a Mac Russo Award on my wall at home, my share of writing awards, and a Roy Lang II column devoted to me, and a family of friends I will cherish forever. No matter where I end up. I love you all. I have no idea what will happen to me next, where I'll be come October 2nd (I'll be in bed on October 1). I don't know if I'll be a teacher, a plant worker, a home health nurse for the mothers-in-law, a kept woman, a pool cleaner, a house cleaner or a worker at McDonald's. But I'll always be a writer. A sports writer. With wonderful memories. And friends.